- Save cost with single video delivery over public IP network for video distribution without multiple video transmissions. 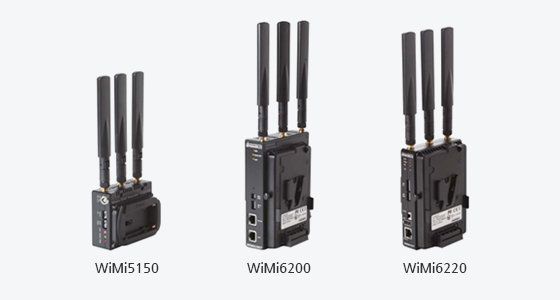 - An WiMi62xxT in Station mode and an WiMi62xxR in Station mode can transmit and receive the video when those are connected each other through one or two wireless Access Points (APs). - f the WiMi62xxT and WiMi62xxR were connected to the two different wireless APs, then two APs must be connected through the LAN or IP network. - Wireless IP address of the WiMi62xxT and WiMi62xxR can be assigned by user, or DHCP of the wireless AP. - The WiMi62xxR can be located anywhere if both the wireless APs are connected each other via IP network. - If the WiMi62xxT and WiMi62xxR were connected to the two different wireless APs, then two APs must be connected through the LAN or IP network. - An WiMi62xxR with LAN mode can decode the video at anywhere the IP network is available. - An WiMi6400R or software decoder like VLC player can decode the video at anywhere the IP network is available. Nimbus, Inc. WiMi series offers Wireless/Ethernet H.264, Full HD (1920x1080p60), encoder/decoder solutions with near zero end-to-end latency (30ms ~ 90ms) over Wi-Fi or Ethernet/IP network.